TOOFLY NYC™ is the signature fashion & accessories collection based on the art, design, and life of New York City's most naturally talented female graffiti artist "Toofly." TOOFLY NYC™ officially launched independently in the Spring of 2007 exclusively online. By the fall of that year TOOFLY NYC™ gained the interest of boutiques nation wide, and countries like UK, and JAPAN. Her Limited edition art prints, T-shirts, vinyl toys and works of art could now be found in selected boutiques and specialty shops in limited quantities. 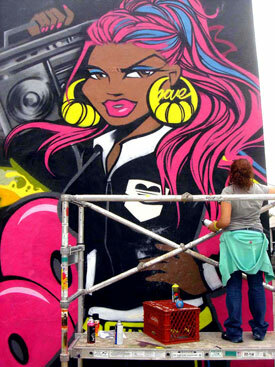 Toofly's art, design, and life is inspired by Hip Hop, graffiti, confidence, knowledge of self, dreams and the diverse experiences she encountered growing up in the worlds most diverse city in the world New York City. Toofly believes in doing what you love, and enjoying the process by encouraging others to produce a life of works that is relevant and special for people. Toofly's constant and active role in the hip hop community allowed her to remain true to her roots, as she continued to draw raw feelings from the ever-changing and spontaneous public art world around her. Her most recent projects include her independent artist collection made up of t-shirts, mini graffiti bags, limited edition art prints, and "all of my love" jewelry line. A new body of canvas, and print work inspired by women's emotions and the hard and fluid energy that embodies them. In addition to her personal works, Toofly and partner Alice Mizrachi have founded a female urban arts collective called Younity in which they are steadily pushing forward with visual art exhibitions, book publishing, and mentorship art programs for young women in the arts. Toofly's art and design work have appeared in various books, video, and magazines such as Graffiti Women, Burning New York, Current TV, MTV Tr3, Trace, Mass Appeal, Juxtapoz, URB, and Honey. You can view the rest of Toofly's body of work at: www.tooflynyc.com & Toofly Myspace.